Fire Tech Camp and Kusuma Trust are partnering up for a second time to bring tech and maker workshops to young people in Gibraltar. Last year Fire Tech Camp brought a team to Gibraltar to deliver robotics workshops to about 200 young people. Following on the success of that course, the programme has been expanded to afterschool workshops for Years 8 and 9, and in school workshops for Year 3. The team expects over 600 children to participate in the workshops this year. 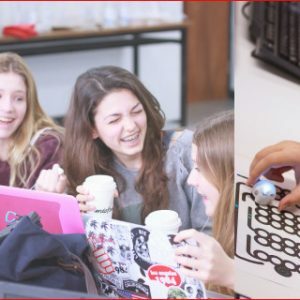 Next week, Fire Tech Camp are bringing a team of 12 expert tutors from Imperial, Cambridge and other top universities to support and develop the students’ interest in creative tech, through three workshops that will get kids building, inventing, and developing their computational thinking. Year 3 students will be programming Ozobots, the all-singing and all-dancing programmable robot that responds to colour-coded commands. Year 8 and 9 students will choose from two workshops – one using BinaryBot kits, powered by the BBC’s popular micro:bit, to get UFOs flying and sensing temperature, light and motion. The other workshop will use littleBits’ Gizmo & Gadgets kit to invent, remix and share their gadgets, built using snappable electronics. Thanks to generous financing by Kusuma Trust, the Year 8 and 9 participants will get to keep their kits and keep coding after the workshop ends. “It’s one of the best learning experiences we ever had,” enthused one of last year’s workshop participants. Fire Tech Camp will also be bringing creative tech training to Gibraltar teachers – providing them with training, ideas and confidence to use some of the hottest tech kits and platforms to motivate their own students around tech and computing. Fire Tech Camp are the UK’s leading provider of tech education for 9-17 year olds. Launched in 2013, Fire Tech Camp has delivered over 4000 courses and workshops, in 20 subjects. Fire Tech Camp are committed to making tech education accessible to all children and scholarships are available to support this goal. For more information see www.firetechcamp.com or contact Jill Hodges at jill.hodges@firetechcamp.com.